Hollywood homicide detective Petra Connor has helped psychologist Alex Delaware crack tough cases in the past. And in Jonathan Kellerman’s New York Times bestseller Billy Straight she took the lead in the desperate hunt for a teenage runaway stalked by a vengeful murderer. Now the complex and wryly compassionate Petra is once again at the center of the action, in a novel of cunning twists and page-turning suspense. Lifeless bodies sprawl in a dance-club parking lot after a brutal L.A. drive-by. Of the four seemingly random victims, one stands out: a girl with pink shoes who cannot be identified–and who, days later, remains a Jane Doe. With zero leads and no apparent motive, it’s another case destined for the cold file–until Petra decides to follow her instincts and descends into a world of traveling grifters and bloodthirsty killers, pursuing a possible eyewitness whose life is in mortal danger. Finding her elusive quarry–alive–isn’t all Petra has on her plate: departmental politics threatens to sabotage her case, and her personal life isn’t doing much better. If all that wasn’t enough, Isaac Gomez, a whiz-kid grad student researching homicide statistics at the station house, is convinced he’s stumbled upon a bizarre connection between several unsolved murders. The victims had nothing in common, yet each died by the same method, on the same date–a date that’s rapidly approaching again. And that leaves Petra with little time to unravel the twisted logic of a cunning predator who’s evaded detection for years–and whose terrible hour is once more at hand. “Why is it so hard to put down a Kellerman thriller?” asks Publishers Weekly. “It’s simple: the nonstop action leaves you breathless; the plot twists keep you guessing; the themes . 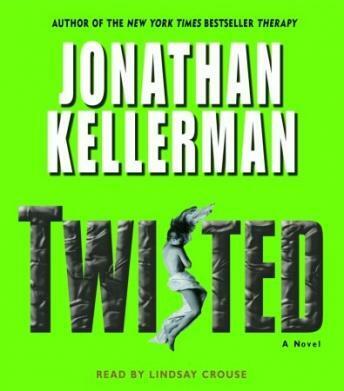 . . are provocative.” Those in need of still further proof that “Kellerman has shaped the psychological mystery novel into an art form” (Los Angeles Times Book Review) need look no further than Twisted. Good book. Multiple plot lines, characters dealing with their own personal issues. The narration is 95% monotone - making it difficult to distinguish between characters, and sometimes between dialogue and narration. Additionally, she did some scenes in multiple takes, generating emotional shifts that didn't really exist. I found it amusing that when the narrator did accents, she significantly ramped up the emotion. However, her mostly single-emotion presentation seems to reflect the inner workings of the lead characters' thought processes, and that redeemed the entire performance for me. What I most loved about this book is that I live in the part of LA where the book is set. One of the characters lives a few houses down the block from me! I think being able to picture the locations in vivid detail enhanced the book for me. Overall, I recommend Twisted. Another intriguing story from Jonathan Kellerman. What I like about this book is the multiple plot lines. Should we ever be content with one mystery? It requires a bit more than passive listening, but if you can track the characters and the layered challenges for Detective Connor, you come away believing that you have been given a glimpse into the realities of police work in the context of real life. Handling multiple job related assignments, a crabby boss, personal relationships, emotional instability, and a lovestruck rookie -- sounds like it could be anybody's life. The only negative is the narrator. Her staccato presentation requires careful listening to discern dialogue and emotion. I was left wondering if she was disengaged, or trying to sound like a court stenographer reading back a transcript. I really loved this book - kept my interest even with several plot lines. I hated leaving the car and finally took the CD into the house to listen some more! A very well-written mystery that constantly kept my attention from beginning to end. Narrator was exceptionally talented. The book was entertaining - all of Kellerman's books are. This one was average fare for him though. The narration had much to do with that. Her monotone style failed to provide me with any sense of each character's emotional state, and kept the same tone for each character - which made it a challenge to determine which character was speaking at times. I felt like I was right in the middle of the story. I loved the characters and the story was so detailed and rich that I didn't want it to end. It had me guessing to almost near the end before I started to figure it out. A fun book to solve. The story was pretty good, although not as good as some of Kellerman's other novels. What ruined this book for me was the narrator. She did not change her voice from character to charater and I had a very hard time figuring out who was saying what to whom. I found this a little slow to start, but the pace picked up and I enjoyed it very much. I've only read a few of this author's books, but have enjoyed them all.